Since its founding in 1996, Diaquip has successfully serviced the requirements of the professional global diamond drilling and sawing industry. This has been achieved through the development of an exciting product range of quality and functionality combined with a business ethos that puts the needs of the customer at the very heart of the business. Jonathan Shaw, the founder of Diaquip in 1996, and now the companies managing director, identified a gap in the market for a company to manufacture and supply the highest quality products for diamond drilling and sawing. A business philosophy based on manufacturing excellency, respect for employees and stakeholders, combined with servicing the real needs and requirements of its customers, has seen the Stockport, UK, based manufacturer go from strength to strength. Impressive growth has been achieved based on the continual development of products and services. This development draws heavily on over twenty years of experience and knowledge combined with a vision of ‘more speed, more life, less cost’. This has directly led to products being developed of the highest quality after undergoing many hours of extensive research and development. Thus complacency has not been an option for Diaquip, resulting in the company not sitting back when it comes to satisfying the needs of the market through developing even higher standards of product excellence. One of the things which makes Diaquip stand out is the pervading attitude of nothing is impossible when it comes to servicing the needs of its customers. The management and staff of the company sees itself very much as a progressive leader in the diamond cutting products market, which has enabled it to be increasingly the chosen provider for diamond drilling and sawing technology. Through a reliable and friendly customer service culture, a positive attitude pervades the company which has enabled Diaquip to meet a myriad of challenges with a ‘can-do’ attitude. In practical terms that has seen the actual products developed focus on the needs of the extensive global customer base, with tangible benefits such as reliability – in service, in delivery, in results, in accountability - dedication – to servicing customers, and colleagues – and vitally, excellent customer relations. In effect, success for Diaquip has been achieved through developing successful long term relationships with its customers. The company prides itself on a fast, friendly service and being able to advise its customers on the best product to meet their exacting requirements through the companies dedicated team of diamond drilling and cutting product experts. During its twenty or so years in operation, Diaquip has developed a multifaceted and extensive product range which is capable of meeting the requirements of the diamond drilling and sawing industry, whatever the application. The actual offering is concentrated around four areas: diamond core drills, saw blades (wall, floor and handsaw), wire saws and related machinery. With such an extensive product line, dealing with individual customer requirements is pretty much essential. To this end Diaquip has its own dedicated technical department which is on hand to provide specific advice on material, tools and equipment from 7.30am to 10pm Monday to Friday. The ‘D Team’ as it is known, is just another way in which Diaquip is able to go that little bit further in assisting its customers. Continual development is key to the success of the company and has seen Diaquip recently take a closer look at the markets requirements. Through identifying the real needs of its customers, Diaquip has cleared its coredrills products of ‘pretty paintwork’ and any unnecessary costs to ensure the product given is a laser welded ‘Raw Core’. By laser welding the product, Diaquip has been able to make the Raw Core range achieve higher levels of value due to its strength, speed, quality and reliability, all of which are derived directly from its manufacturing. Likewise, the proven, highly professional diamond wire range is now more than ever focused on presenting a solution to whatever challenge the customer has. Diaquip’s DQ1 presents an efficient solution enabling customers to deal with a wide range of applications. These include nuclear and offshore oil rig decommissioning projects, as well as dry cutting applications. This development culture has seen Diaquip’s DQ5 wire be a major step forward in diamond wire sawing. Setting new industry standards, it has delivered a ‘quantum leap’ as a fast cutting and long life concrete wire. Furthermore it has been generally acknowledged as the ‘next generation’ in wire sawing due to its efficiency and speed without sacrificing its operating life. Diaquip’s blades range from 230mm diameter up to 2200mm diameter. Manufactured in Stockport, this extensive range clearly demonstrates the fact that Diaquip possesses solutions to suit virtually any requirement whether it is hand sawing, wall sawing, floor sawing or ring sawing. Having a unique approach to the requirements of its customers has meant that Diaquip is able to now offer large bespoke blade manufacturing services from one of the only fully automatic brazing machines in the UK. Having been designed, developed and manufactured with leading-edge technology, Diaquip is confident that its TrimexTM range is a true market leading solution, delivering exceptional speed and long operational life time at the cutting edge. Harvey continues, “At Diaquip, we want to increase our market presence around the world. Recently we have made inroads into some of the worlds geographically largest markets and expect this to grow. Thus at the end of last year, we sold over 2000m of diamond wire in one order for slot cutting on a damn in North America.” In fact thousands of meters of the highest quality wire are provided for use in the nuclear, oil and gas industries. This has proved to be especially effective and valued in decommissioning plants as well as countless highly challenging reinforced concrete structures. Given the expertise and quality behind the Diaquip products, it is hardly surprising that demolition contractors have been quick to take advantage of the benefits to be derived. One such company used the DQ5 diamond wire with Diaquip’s Fusion TechTM Technology on a project in London where the company was commissioned as the main demolition contractor on the seventy five week project prior to renovation work taking place. The part of the project which saw Diaquip diamond wire used involved saw cutting and the careful removal of the existing lower three floors, leaving the steel structure temporarily supported. The Diaquip diamond wire was put to good use with its fast cutting spend which kept the structure safe despite working with heavily reinforced concrete. Likewise, a leading sawing and drilling contractor in Qatar, was commissioned for a thirty week building renovation project. This included cutting forty 3m x 3m reinforced concrete foundations with C40 Newton concrete strength, each containing one hundred and eighty pieces of 20mm rebar spaced 150mm apart. A Hilti wire saw was used running at 22m per second fitted with Diaquip DQ5 diamond wire was chosen for the project. Manufactured using a totally new method, called Fusion TechTM which provides the DQ5 with improved speed and operational lifetime. This enables it to be used effectively on virtually all concrete types, including the highly reinforced concrete or concrete with exposed steel found in Qatar. As part of both its developing customer focus, and aim to be No 1 in its core business areas, Diaquip has recently launched a series of new products which have certainly captured the market’s imagination. 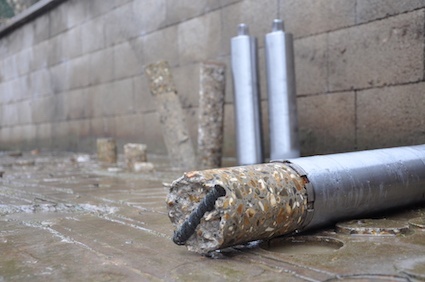 One of these is already mentioned ‘Raw Cores’, a laser welded core drill which is available in nine different specifications to deal with any application. The Raw Cores are manufactured entirely in the UK using high precision engineering and superior materials to the exacting standards Diaquip is famous for. “Being laser welded ensures a perfect weld. Concentricity ensures easier starting, deep drilling follow on accuracy, as well as improved operator experience, strength of segment, impact resistance and longer coredrill life,” explained Diaquip’s Roy Chadwick concerning the benefits of this addition to the Diaquip product range. As well as the above, Diaquip also has other new products in the pipeline. “The DQ machinery range is soon set to be expanded as we have some great new products on the way to join the DQ machinery family,” commented Harvey Beech. With the customer focused services and product development, backed by a technical and service team with the know-how required, Diaquip is well on its way to fulfilling its avowed aim of being the market leader in its four key areas of expertise. As the examples given shown, this expertise is particularly well suited to the requirements of the demolition industry, which can look forward to being serviced by Diaquip for many years to come.